Whether you want extend your home or create more open plan living. We are here to design and build to create the look you desire. 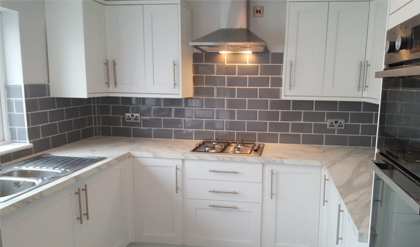 For well planned modern kitchens designed and fitted from start to finish with one supplier. Book us today for a complimentary design visual and quote. Unique bathrooms finished in a modern style. All design, plumbing and tiling work done by one company to your vision. We are independent local company based in Birmingham, providing home renovation and building services to domestic properties. Integrity is at the heart of what we do. We work with the client from design, plan, build to finishing touches. We have wealth of knowledge as worked within the building industry for over 20 years. SIB Builders was formed in 2013 by Steve. Based in Rednal, South Birmingham we are located close to motorway networks allowing us to service the Bromsgrove, Worcestershire area as well as localities within Birmingham.